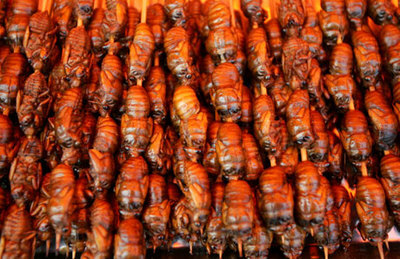 Insects have enjoyed a place at the Japanese dinner table for many centuries. Well, perhaps "enjoyed" is a word that could better be applied to those eating them - people! Japan, while an exceptionally fertile land, hasn't always provided its human inhabitants with the wide range of animal protein we take for granted here in the West. Fish and seafood have been the mainstays, along with the occasional wild boar... augmented with a variety of native insects. While many may find the thought of eating insects distressing, disturbing and even disgusting, to others it's the bee's knees. Sunny side up, please. 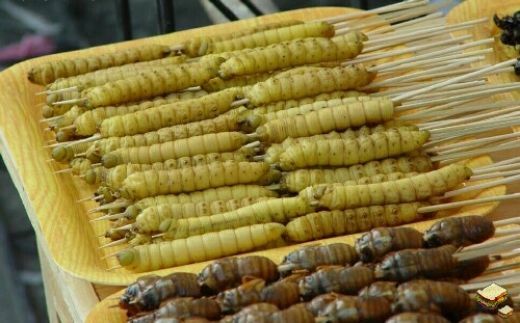 It should be said at the outset that Japanese insect foods are exotic, local niche items that the vast majority of modern Japanese have never - and likely would never - try even once in the course of their lifetimes. 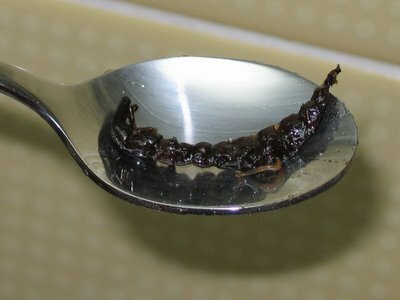 While insects have often been exploited to fill gaps in the human diet caused by famine, war or poverty, insect foods have also been favored by the highest levels of Japanese society... one of the late Emperor Hirohito's favorite foods was fried wasps with boiled rice seasoned with sugar and soy sauce. Wasp Larva: Honey, What's For Dinner? Wasps actually contain the highest percentage of edible protein of any insect - 81 percent! Compare that to the roughly 20 percent edible protein provided by an average steak. Wasps, specifically the type known as Digger Wasps, are baked into crackers - stingers and all - in the Japanese city of Omachi. 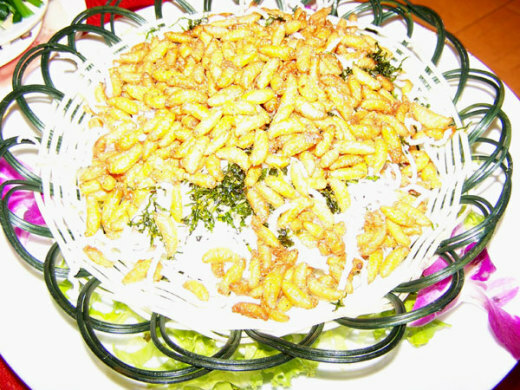 The crispy critters are prepared and promoted by the Omachi digger wasp lovers club - not exactly a pest control service. 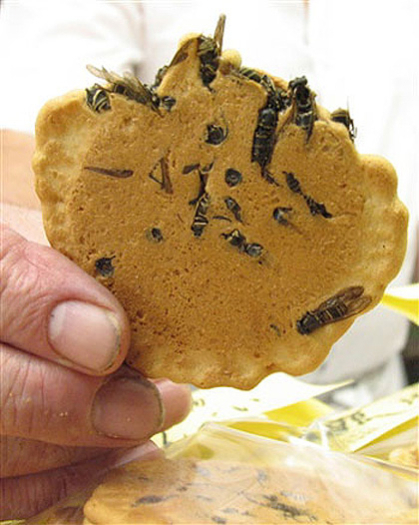 While wasp crackers are an Omachi specialty distributed locally, zaza-mushi (stonefly larvae) are available in cans or jars sold in retail shops and even online. Locusts are the bigger, hungrier members of the grasshopper family and eating them seems appropriate revenge for the immense destruction swarms of them cause to farms and croplands. 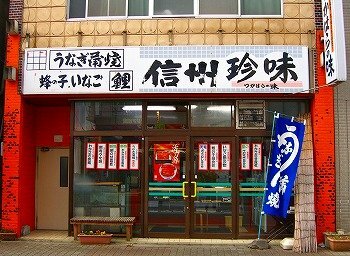 Tsukahara Delicacy (above), a 72-year-old family-owned firm located in Inadani, Nagano Prefecture (obviously Japan's bug-eating capital), has been boiling locusts for the past 60 years. Show me a pest exterminator with a record like that! 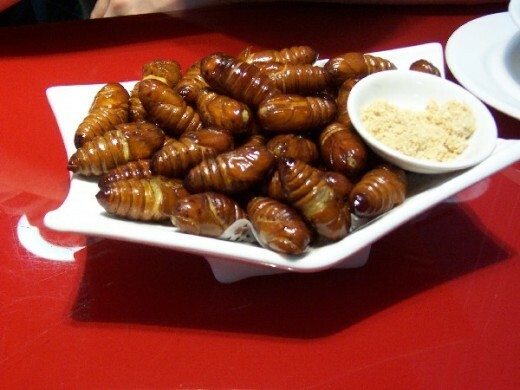 Then we come to sangi, which are boiled and fried silkworm pupae. Actually, boiling silkworm cocoons is how the silk is acquired; what's left are the pupae and, well, waste not want not. Put me clearly in the "want not" category, but that's just me. Lastly, there's semi. Not the 18-wheeled variety, more like the 17-year ones. Cicadas to be exact. Large in size and available in numbers, cicadas offer a welcome protein boost for many animals as well as adventurous humans. Like all insects, cicadas provide an excellent protein to fat ratio and like fish, the fat is of the healthy unsaturated type. 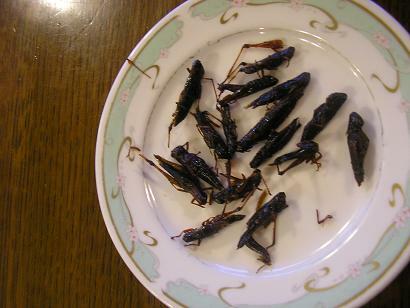 While Japan certainly has no monopoly on eating insects, it is one place where those with entomophagic urges can find satisfaction. It may be good practice as well - considering the many benefits insect eating affords to humans and the environment (negating some of the need for exterminators), putting the bite on bugs just may be the best revenge. Just think... one day when you order up a bucket of wings, there might not be either chickens or buffaloes involved in the preparation. From experience, these taste like peanuts. Seriously, it's quite good to eat. It isn't as big as the picture you posted, however... it tends to be smaller than that.